Natural gas is a flammable gas comprising of methane and other hydrocarbons. It is a naturally occurring gas found underground and is extracted the same as other fossil fuels such as oil. Natural gas finds many uses, from heating to electricity. Natural gas is formed in the same way as oil and coal, where remains of plants and animals over millions of years turn to fossil and eventually become coal, petroleum or natural gas. Due to its gaseous form, natural gas seeps into the large cracks and spaces between the layers. In its original form, natural gas is colorless, odorless and tasteless. 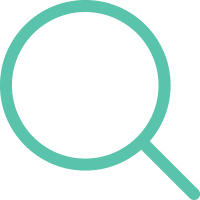 Because of this, distributors add a chemical to give the gas a distinctive smell in order for the gas to be easily detected in terms of any leaks. In its original form, natural gas is drawn from wet natural gas wells, which is mixed with other hydrocarbons and non-hydrocarbon gases. Methane and other gases are extracted from the natural form and processed at a plant. According to the U.S. Energy Information Administration, over 60% of natural gas is used for electricity generation and industrial usage. Residential usage comes in third at 17%. The electric power sector uses natural gas to generate electricity. It is estimated that in 2015, natural gas as a source of electricity was 26% of the U.S electric power sector energy consumption. 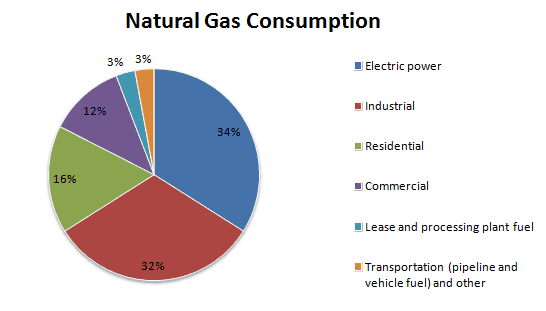 The EIA estimates that around half of the homes in the United States use natural gas. Similarly, the commercial sector also uses natural gas for heating and also for cooking purposes. Finally the transportation sector uses natural gas a fuel to operate the compressors used to move natural gas through the pipelines as well as using natural gas a fuel for transportation purposes. 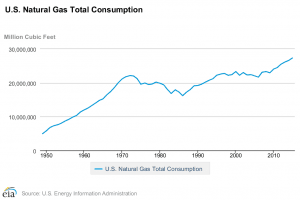 The above chart shows the total U.S. natural gas consumption since the 1950’s which shows that demand for natural gas has been steadily increasing. Within the United States, the state of Texas accounts for the largest Natural gas producer at 14.3%. Other states include California (9%), Louisiana (5.4%), New York (5.3%) and Florida (4.9%). 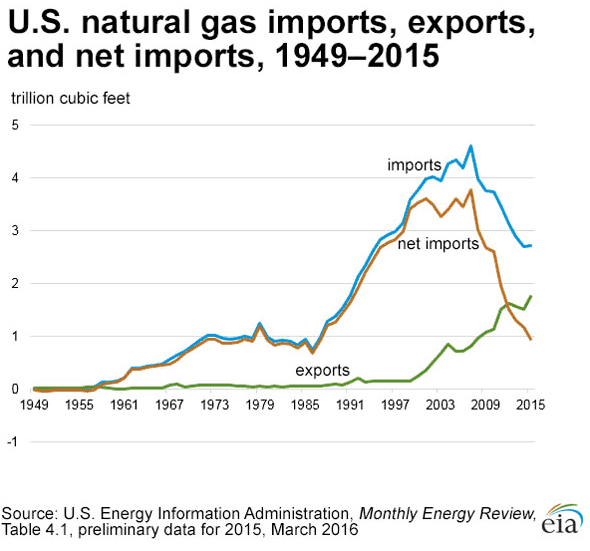 Despite producing natural gas domestically, the U.S. is a net importer of natural gas, meaning that the nation imports more natural gas than it exports. However, in recent years, the imports of natural gas have declined on account of increases in domestic production. As of 2015, the U.S is estimated to have imported 2.72 trillion cubic feet of natural gas while exporting 1.78 trillion cubic feet which accounts for net imports of 0.93 trillion cubic feet. The total net imports of natural gas accounted for about 3% of the U.S. natural gas consumption. Canada ranks on the top as the leading exporter of natural gas to the United States, followed by Mexico which accounts for less than 1%. Natural gas is transported via pipelines in a gaseous form while also being transported by sea in specialized ships. Over the sea, natural gas is cooled to -260° Fahrenheit at which point the gaseous form turns to liquid. In terms of volume, the Liquefied natural gas is 600 times smaller than the gaseous form. LNG is exported to the U.S. from Trinidad and Tobago, Norway and Yemen. From the above, we can see that natural gas forms an integral part of the U.S. energy portfolio alongside other fossil fuels such as oil. For a commodity that has a wide reach of its usage, speculators need to understand the factors that play a role in shaping the prices of the natural gas futures. 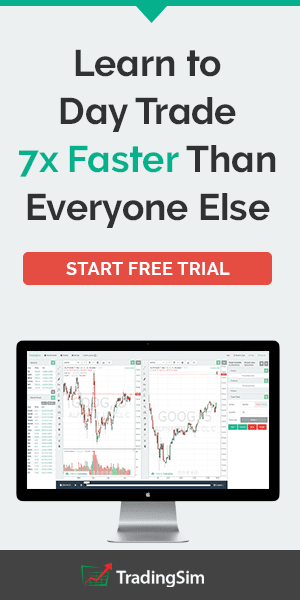 Natural gas futures trading are offered by the CME Group and allows for hedgers and speculators to take advantage of the standardized contracts. 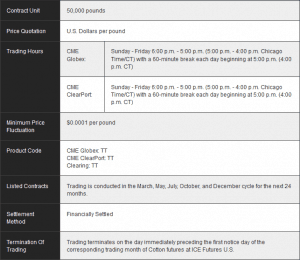 There are many different contract types that one can trade in the natural gas futures markets. Below is a summary of the Natural gas futures contracts. 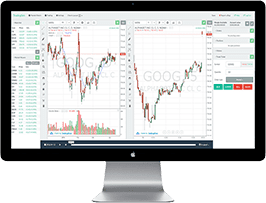 In order to trade natural gas futures successfully, day traders should know about the fundamentals governing the natural gas futures markets. Here are the five things that influence the price of natural gas which eventually impacts the end consumer. Demand for natural gas runs in cycles, depending on the time of the year and also the seasonal changes. Overall, the demand cycle for natural gas is quite straightforward. Generally demand for natural gas typically rises into the start of the winter months and eventually falls as spring arrives. Demand is obviously at the highest in the colder months, but commercial entities start to stockpile for the winter months ahead of the seasonal changes. The demand for natural gas can often result in increased prices as residential and commercial usage for heating, cooking increases tremendously during the winter months. 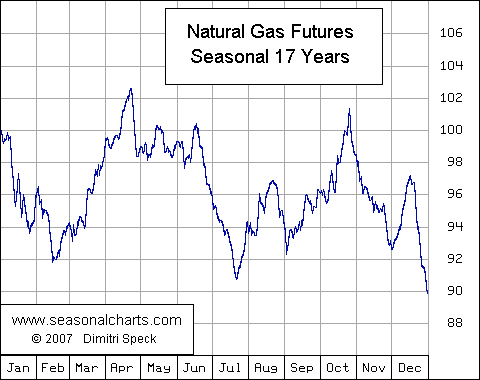 A typical seasonal chart pattern for natural gas futures is shown below. Natural gas futures tend to strengthen from the November months and prices hit the peak around the April – May period. With the onset of spring, natural gas futures prices start to fall from April – May and usually bottom around the July – August months during the peak of the summer months. Thereafter, prices start to rise steadily picking up pace as the winter months approach. Although the seasonality looks straightforward, recently natural gas has found its use in electricity generation as well, which tend to bring anomalies to the seasonal cycles. While the requirements for natural gas for heating declines in the summer months, demand for cooling in the commercial/industrial sector tends to rise in the summer month as well. With electricity forming the main source of cooling during the summer months, it leads to an increase in demand for natural gas during the summer periods as well. Due to the fact that natural gas is an essential element used in the generation of large scale electricity in the United States, increased demand for electricity often translates to higher demand for natural gas. These anomalies are often accentuated during seasonal patterns of harsh summer months that come every so often and can lead to spikes in prices due to increased demand. Natural gas is widely used in the industrial and commercial sector as well. Understanding the sector-wise demand plays an important role in figuring out the long term factors that affect the prices of natural gas. To ascertain the long term demand, it is essential to understand the industrial trends and the sectors that make use natural gas as a source of electricity and power generation. This can vary from one industry to another. The industrial sectors where natural gas is heavily used include pulp and paper, metals, chemicals, petroleum refineries, stone, clay and glass, plastic, food processing. The above sectors account for over 84% of natural gas uses in the industrial sector. The overall state of the economy also plays a crucial role in determining the price of natural gas. The general state of the economy in the United States can affect the demand for natural gas in the short to medium term cycles which are even more important in the industrial sector. Generally, during periods of increased business activity seen during a pickup in the economy, the demand for natural gas increases at a similar rate. Similarly, when the economy goes through a slowdown or a recession the industrial output also slows. This leads to lower demand for natural gas which eventually results in lower prices. The economic fluctuations resulting in the industrial output that accompanies the economy’s up and downswings affects the amount of natural gas used by the industrial sectors. The above chart for instance shows the weaker prices in natural gas during the 2008 – 2012 years where weak pace of growth in the economy was reflected by weaker natural gas prices during the period. We know that natural gas futures prices tend to strengthen into the winter months and then turn weaker in the summer months. However, sudden changes to weather patterns can play a significant role that can throw the cycle out of sync. La Nina is a weather event that tends to follow an irregular cycle which primarily affects the equatorial Pacific Ocean. However, this weather pattern tends to play havoc with the U.S. weather system as well. It is estimated that La Nina occurs every 3 - 5 year period but is also known to occur in successive years. The effects of La Nina are usually stronger during the winter months, which can lead to unusually harsh winters. This in turn can see higher than average demand for natural gas for heating purposes which can push prices higher. As a natural gas futures trader, it is essential to pay attention to the weather patterns. 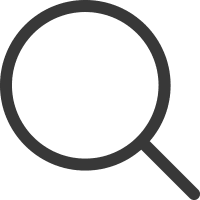 You can get a broad idea of the duration of such anomalies which can give you a better handle on how long demand will remain during the harsh winter periods. Natural gas storage plays an important role in balancing supply and demand. Natural gas supplies are held in underground storage wells and help to act as a buffer during unexpected periods of high demand. The natural gas storage is crucial as it helps to meet the demand which is otherwise unable to be met by domestic production and by imports. During periods of lower demand, the storage helps to absorb the excess production and thus also play a role in reducing the import costs. The natural gas storage wells also support the pipeline operations. Seasonally, storage tends to increase in April through October in anticipation of higher demand during the winter months while at the same period the demand is low during the early spring through autumn months. The U.S. EIA publishes weekly natural gas inventories report which gives the build up or drawdown of the natural gas in the commercial storage. This crucial report often moves the natural gas futures prices and can also act as an early indicator on the seasonal demand patterns. In conclusion, natural gas futures are one of the important energy commodities in the United States. It is a highly active futures trading product and is also one of the actively used commodity as well. Traders can speculate on the short term movements in the natural gas futures prices by keeping in mind the above factors that can influence the prices of natural gas futures.